Carol, one of my readers, brought this trick to my attention. Usually zucchini plants require a lot of space–in a square foot garden, it takes 9 squares. I tried giving it less space and growing it on a trellis, but that didn’t really work. By pruning and staking zucchini, you can grow them in significantly less space, with no loss of productivity. Here’s how it works. Plant a 4′ stake in the ground right next to your zucchini. It’s best to do this at the time you plant the seeds, so you don’t risk damaging the roots. As the zucchini grows and produces fruit, cut off all leaves between the fruit and the ground. When it gets long enough, tie the vine to the stake. Not only does this take up less space, it makes it so much easier to see when the zucchini is ready to be picked. Last year I tried pruning the zucchini; the plant yielded less, but I still had plenty of zucchini. From Carol’s pictures, it looks like it only takes up one square–so you could grow zucchini in 2 or 3 squares, get the same harvest using just 1/3 of the space. Here is a video where Carol learned how to do this. Watch from 6:05 to 7:05 to see the zucchini. What kind of fertilizer should I use on my potatoes? They will be fine. No pollination help needed. Have used this method for 2 years and it is great. I put a 5 ft. re-bar, 2 feet into the ground when I plant the zuc. I use the plastic streachy garden ties to help hold the zuc plant up. I trim the leaves that form below a zuc when I pick it. I always do it in 1x 1 square foot section in my 4 x 4 raised box. Just dont let the zuc get to be huge, it will pull the top of the plant over a bit. This system works great, a must try!!!!!! Also as an idea that works great for zucchini and squash. I use a tomato cage to keep it in check. Works great and keeps it off the ground, giving me the opportunity to grow much more in my sfg. To anyone who is thinking about trellising your zucchini, DO IT!!! It works! I am doing it this year in a SFG. It is working great. The plants are thriving in the one square foot. I put a 4 foot piece of rebar, two feet into the ground and am using the other two feet to support the zucchini. When the zucc gets taller then the support, I will put a piece of 3/4 inch conduit over the rebar. You can make your support as tall as needed. 6 zucchini so far and more are on the way!!!!!! Thanks for sharing this idea. My zucchini takes up a little more space in my SFG than it should but next time I’m going attempt this method! That was an amazing video…super informative. I cannot wait until next spring to try the staking technique! Very good video. I will try this this year and let you know. Thanks for your site. I just saw this on pinterest and have to say it’s an amazing idea! Definitely going to try it – thanks for sharing! I have seen the video from the British/Aussie gentleman about “trellising” zucchini. My question is, do you wait until the first zucchini gets picked before you cut the leaves below the ripe zucchini, or can you cut the lowest leaves as the plant is growing before the first zucchini has started, to drive the “vining” response? Would that interfere with flower growth? It would seem the zucchini plant would get very big in a square foot garden before the first zucchini would be ready and shade anything next to it. I did it with bush varieties. Are the plants being staked bush variety or vine? I have seeds for zucchini and summer squash bushes and would like to save some space. This looks like a great option for me as long as it works with bush varieties of squash. That’s just what I’ve read–I have minimal experience with container gardening. Why do you say that in container gardening you are more likely to have desease than that of square foot gardening? easier to travel from one plant to another. Realistically, it’s taking about 2 squares. How many squares were you able to grow it in? One? I used this method this year and had GREAT success! However, I ran out of my 4 ft stake… but the vine just continued to grow up on its own, and it was strong! I was so proud! Until…. it snapped! Ugh! Not sure what to do next year when I run out of stake, maybe I will zig-zag/snake the stem a bit to take up more vine in less vertical space? Not sure… but I will say, this method DOES work- and I was so super proud of my first SFG yellow squash! 🙂 Thank you for the suggestion!! Nope, it’s great to put in the stakes right when you plant, but you can add them a little later. Thanks for posting this, I think that is pretty cool. 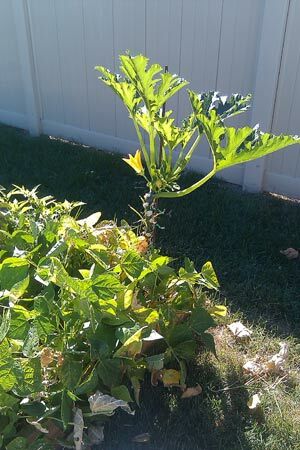 My zukes plant is already huge but I think i may try this on at one of them! Will it work even if it is an open bush (Elite) zucchini plant? Dana–not that I’m aware of, but I haven’t researched that specifically. Meredith–There’s a photo here about staking tomatoes–I’m wondering if you could use the tripod method? I love this idea of pruning away the zucchini and would like to try it this year. My question though… is how can I stake the plants? My garden boxes are on concrete and have wooden bottoms with drainage holes. I use Mel’s mix, so I don’t imagine the 6″ depth of such a loose soil would hold up the stake alone, much less the plant’s weight. Do you have any suggestions? I used the wire tomato cages I had left over from the year before last year to stake/contain my zucchini and it worked great. I read a trick about using aluminum foil around the stem of the plant to discourage the vine borer. It needs to be wrapped around the stem at the time of transplanting and buried a couple of inches as well as up the vine a couple of inches. The vine borer is either confused or cannot lay its eggs. It worked for me . I saw a couple of the moths in the garden which I quickly captured and disposed of but I never had any of the plants infected. Just remove the foil after the egg laying season is past so you don’t strangle the stem. Thanks for posting this video! With everything else I plant, I only have a 3×5 bed to try & fit my zuchinni & squash. I’d wondered about pruning & trellising but w/out seeing it in person it’s difficult to imagine. Now I’m ready to try it &, hopefully, gain some more space! When you tried pruning last year did you still get decent production per plant? With this method I’m hoping to plant 3 zucs & 3 squash and get a decent harvest! I’ve never gotten a decent harvest here in Sac, CA anyway so might as well try this! Love that he just stakes them up – no creating more trellises! Thanks for all the great info you continue to provide us! Cara–I am just discovering a world of male and female flowers on squash. As I understand it, some random plants will only have one type, which doesn’t allow pollination to occur. Other times there are not enough bees to pollinate, and you have to do it yourself. 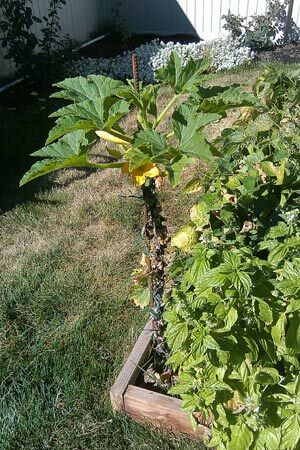 I pruned mine this way last year, and did not have a problem with pollination–I had plenty of zucchini. I am going to try this this year with my zucchini and cucs with the tomato cages I built. I have read that you can buy “vining” zucchini and they should climb the cages with some help. Thanks for your great blog. I have been meaning to send you my pictures from last years garden. I did try pruning zucchini–but I didn’t stake it. It still took up less space and was easier to manage, but I’m definitely going to upgrade to staking this year! I haven’t yet started researching any pest problems, hopefully this season I’ll be able to! Are you kidding!? This is FABULOUS!!! It will help me contain the unruliness of my zukes AND help with the “oops, look what giant produce was hiding under the leaves” problem! Read here for info about pruning tomatoes. Wow! That’s really interesting. thanks for sharing that video. Does it take a lot of time to do this pruning? I’m thinking I might try a bit of this for tomatoes as well. Would this method also work for yellow summer squash?